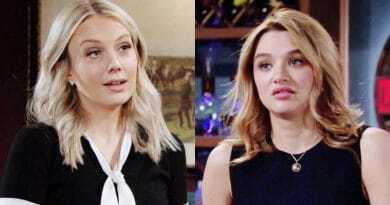 Young and the Restless spoiler say Abby Newman (Melissa Ordway) scrambles for a solution in the near future. As her restaurant is set to open in the next week, this spoiler might fall hand in hand with the opening. However, as Abby has struggled in the last few weeks, this is the last thing she needs. Things simply aren’t looking up for Abby Newman, it seems. Not too long after ending her engagement with Arturo Rosales (Jason Canela) after learning that he slept with Mia Rosales (Noemi Gonzalez), Abby had to get to work on her restaurant opening. As she’s been preparing for this restaurant for a while, she had no problem with throwing herself into her work. Abby Newman also decided to quit her job at Dark Horse. She couldn’t be around Arturo Rosales in any capacity. Now, it appears that Abby must do some damage control, according to new Young and the Restless spoilers. Obviously, this means that something damaging happens. As she’s preparing for her restaurant launch, this damaging moment could be related to the opening. However, in the state that Abby is in, the last thing she needs to do is try to fix things. She might just make it all worse. It’s clear to everyone on Young and the Restless that Abby Newman is still struggling. She trusted Arturo Rosales, and he betrayed this trust. He slept with his brother’s wife, no less. Abby can never forgive this. While she’s thrown herself in work, this might not have been the best idea for her, especially as new spoilers confirm that she must fix some situation. In her angry and hurt state of mind, she may have done some things in her business that she’ll end up regretting. Pushing for the opening to happen this soon after Lola Rosales’ (Sasha Calle) attack could be something she regrets. After all, Lola hasn’t completely healed yet. Certain moments have hinted that Lola may have a few health problems down the road as she struggles to heal from her liver transplant surgery. Abby may regret ever pushing Lola, the head chef, to this soon of an opening. If Abby Newman finds herself attempting to fix some new situation, she could find herself in trouble. Obviously, this is the last thing that she needs. Everything has fallen apart for her in the past few weeks, so she could really lose it upon this latest situation. Of course, this situation could have nothing to do with her restaurant on Young and the Restless. After all, Abby sometimes puts herself in other’s drama. She could even find herself in her mother Ashley Abbott (Eileen Davidson) and Jack Abbott’s (Peter Bergman) battle, if she’s not careful. There’s also Mia Rosales to consider. Abby Newman hates her and may want revenge. Regardless, it appears that she has a long road ahead of her. This latest situation may end up being a bigger dramatic deal than she needs at the moment. Will she successfully fix the latest situation, or will she simply make the whole situation that much worse? Check back with Soap Dirt often for even more Young and the Restless spoilers.